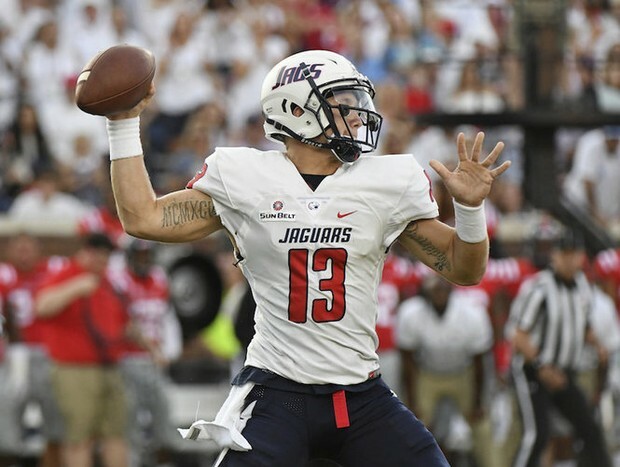 South Alabama quarterback Cole Garvin has been suspended following an arrest on a public intoxication charge early Friday. Garvin, who started the Jaguars’ opener this season and seven games in 2017, was booked into Mobile County Metro Jail at 4:19 a.m. Friday. According to jail records, the 22-year-old was released on bond at 8:57 a.m. and has a court date scheduled for Oct. 10. According to a statement from the South Alabama athletic department late Friday, Garvin has been suspended until further notice for violation of team rules. The Jaguars (0-2) face Texas State (1-1) in their Sun Belt Conference opener Saturday night at Ladd-Peebles Stadium.